Las Vegas restaurant operators, under pressure to deliver better bottom line results and customer satisfaction in the face of rising costs, will be turning to technology for answers within the next year. That’s the takeaway from the recent Multi-Unit Restaurant Technology Conference here. The restaurant industry is one of the few businesses that truly makes up the foundation of Las Vegas commerce. While nightclubs, attractions and even entertainers come and go, both the fine dining restaurants and the casual quick-serve places have been mainstays on the Strip, withstanding the test of time. Now with a wide variety of restaurants on and near the Strip, from chain restaurants such as White Castle that debuted in 2015 to longtime fine dining establishments such as Piero’s Italian Cuisine that has been in Las Vegas over three decades, more attention than ever is being placed on the customer experience at restaurants. As nongaming revenue continues to take priority with Las Vegas casino resort operators, increasing the efficiency of fast-food, casual dining and fine dining operators is a skill that continues to be enhanced. The busy spring and summer season on the Strip are the main times that inefficencies of the customer experience at a restaurant are noticed. When it comes to adapting to technology, there are several well-known national chain brands that can be found on the Strip that have begun using the latest in mobile and technological platforms to ease the customer experience in other locations across the U.S. The adaptation of technological advances such as kiosks and mobile applications at the local level may pave the way for adaptation by their large Las Vegas locations in the near future. Bucca di Beppo, California Pizza Kitchen and Subway are just a few of the national chains on the Strip that may be bringing newer technological platforms to their famous Las Vegas restaurants. Perhaps the most efficicent tool to handle the Strip’s dining rushes are kiosks, a long-popular feature at restaurants in Europe. 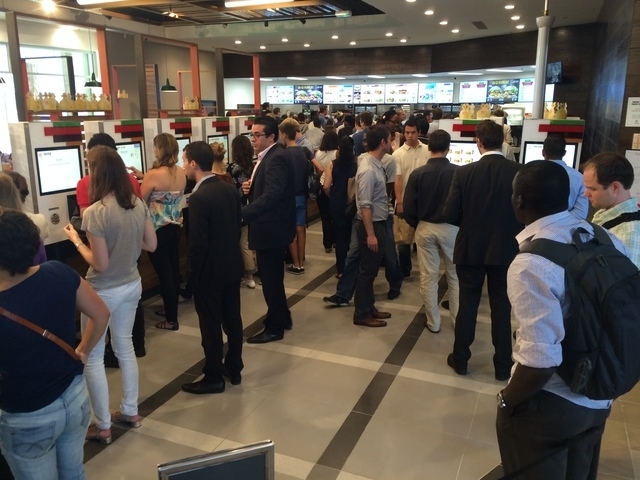 The rise of kiosk use at both casual and fast-food restaurants is definitely a trend coming to Las Vegas for the second half of 2016 and beyond. The further implementation of kiosks at restaurants on the Strip will allow guests to review and even make menu selections before they are seated, allowing for a higher table “turnover,” meaning that more guests will visit the restaurant to add to the establishment’s bottom line. Las Vegas restaurants that are early adapters of kiosks and digital platforms will also experience lower staff turnover as more menial duties are adopted by the technological devices, allowing for employees to have more high-touch customer interaction assignments. The result is that workers feel better performing onsite in everything from customer service to food preparation, Neiman said. The increase in self-esteem with the food service position is often coming with higher wages, as the minimum wage heads toward $15 per hour in many states. The increase in employee pay has forced restaurant operators to take a long, hard look at available technological options to increase efficiency. The most obvious technological options are mobile applications via cellphones. Yum Brands!, operators of KFC and Pizza Hut national chains, uses a technology platform that remembers customers’ favorite and past orders. It is an efficiency that could do wonders on the Strip as many tourists from the West Coast and regular convention-goers visit their favorite Las Vegas restaurants as many as five or six times a year. “Pizza Hut and KFC’s digital ordering platform provides a new method to help the restaurants and their franchisees around the globe increase their bottom line and meet their aggressive revenue goals,” says Perse Faily, chief executive officer of Tillster. With the ability of technological platforms to pre-order and even deliver meals, the future of food service on the Strip is definitely in transition. For the next 12 to 18 months, the Strip will be at the forefront of these changes as it dives more into 21st century technology and away from its roots in 20th century face-to-face customer service.